Attraction is a mystery. Nothing makes sense and even science doesn't know. Case in point: Eventually we must all offer up our celebrity crushes to our significant other and stand there, naked and vulnerable, to be judged for them. And nothing is healthier than giving someone the permission to mock your taste in people who are not them. That is why I love this little piece over at Nerve where a couple debates the merits of each other's celebrity crushes with moxie and verve. In it, Christine Friar and Alan Hanson pull no punches when it comes to discussing the fact that he has a thing for Keri Russell while she thinks Keri Russell is a "human nap as a public figure." Or that she likes John Mayer and he believes John Mayer is "so slimy and plastic-poetry-to-get-yr-pants-off." They are both right, for one thing. For another thing, in a good solid relationship where trust is real and attraction is secure and known, this can be a hilarious exercise in getting to know another person, to say nothing of gathering potentially a life's worth of good jabs, always at the ready. I once knew a couple who took turns posting pics of their favorite celebs on the refrigerator in what seemed like a competition for who could soon evoke the most jealousy in the other, every day a new discovery of one-upmanship until there wasn't a square inch of unprovoked Kenmore space in sight. That is why I especially like when Friar and Hanson go head to head on Trent from Daria, though, because it has that perfect blend of getting the other person's taste while also sneering at it AND the idea of them with anyone else — no easy balance to strike.Christine: I've long had an attraction to simplistic, solid armband tattoos on floaty dudes who are conceptually attractive but practically/interpersonally nightmarish (a la Brandon Boyd), so Trent was the pretend, accessible version of the type of aggressive yoga burnout who would have that kind of bodyart. Fourth grade me was very, very on board. 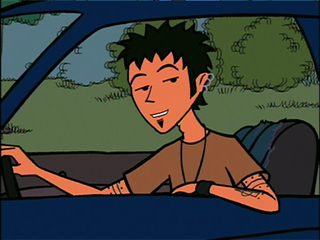 Alan: Trent was very cool despite his horrible style. Like, being attracted to his attitude and slackerdom is fine with me. Wanting to bone an extra in a Godsmack video on the other hand, not so much. But I get what you're saying. I think he may be the only version of said type to transcend its pukeable qualities that I know of. I hope you two live happily ever after in a Venice Beach bungalow close enough to a raw vegan market and far enough away from me. Never forget: She had a crush on John Mayer, not to mention "conceptually attractive but practically/interpersonally nightmarish (a la Brandon Boyd)" — NOOOOOOOOOO CHRISTINE NO MAKE IT STOP — But really, everyone should have this kind of loving push back. I mean it. But this leads me to a deeper question: What do our celebrity crushes say about us or our significant others? Do they mean anything? Are they indicative of "types" we have, unfulfilled longing, secret fantasies, or just a random selection from the buffet of celebrities paraded in front of us, because we can? I submit they are a way of talking through every facet of ourselves and our needs and outsourcing what cannot be possibly met by any one person to the imaginary boyfriends in our heads. Uh, right? And moreover, what about when you find out your significant other's crushes are totes gross or merely nothing at all like you, and that what gets them hot and heavy on the daily is, in fact, Julia Roberts and you are not her because who among us could ever achieve such singular, handwringing beauty? I repeat: Could you love someone who loved John Mayer? Brandon Boyd? Or who actually crushes on the Bieb? Is there a dealbreaker in the world of celebrity crushes, and might it be liking a celeb too random/unappealing to even merit a crush? What if your celebrity crush is not douchey per se, but reveals a "type" they like. Would you rather the type be like you or not like you? This seems like a no-brainer, but I will wager that the only thing worse than not being your SO's type is being their type. It is truly lose-lose. Because when you're not their type, you can wrestle forever with the idea that their attraction to you is just not instantaneous and potent enough, OR, even worse, that you are exactly his or her type, which means you are but one out of a million head-turners on the conveyer belt of people who look just like you that make up the topography of desire that is their inner life. I just wrote "topography of desire." Clearly the best way for someone to feel about you is uniquely, singularly attracted to you in such a way that crushes all crushes and sets a new bar for desire, amirite? Regardless, tell me everything: Do you know which celebrity your SO most wants to bone? Do you care? Is it his/her type? Are they gross? Are you? Please no comments about people who have a list of celebrities it is OK for each of you to sleep with should the nonexistent option ever arise in your pathetic contingency planned lives. That is a totally different issue altogether.